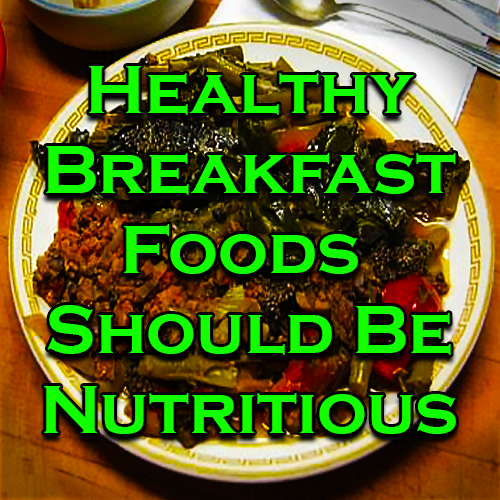 Healthy Breakfast Foods Should be Nutritious. You never want to start your day off without the proper fuel. I am asking people to rethink their concepts of healthy breakfast foods. Today’s busy lifestyle demands that we be more alert and mindful than in the past. Furthermore, as we contend with the modern world’s requirements for brain work we really don’t want to be lethargic and complacent. However, our breakfast or sugars, starches and, in general sweet stuff gives us a quick boost then dumps us into lethargy and mental fatigue. (1) This is like giving a robust, vibrant Cop a doughnut. That helps him cope but does not solve problems. No one knows when or why our breakfasts became predominantly a load of starch—starch that we don’t need. This load of sugar (starch) is expanding our waist—and is not helping us or our children to be healthy, vibrant and alert. My Mother said “If you want to be healthy and do a good day’s work, eat a good breakfast. As a matter of fact, this was many years before the food industry re-invented our breakfast. When I was a young man the drumbeat of the food companies was just beginning. “Eat Wheaties the Breakfast of champions.” Well, that was a long time before their newer and less healthful concoctions came along. A healthy breakfast is in the eyes of the diner. Here is one example of what I consider as a healthy breakfast. Finely chopped swiss chard, garlic, sage, and dill as a bed for the hot food, with some horseradish and tomato. Also, add a side of green beans and some ground beef that was fried with hot peppers and celery. I sprinkled some chia seeds on top for added protein and trace elements. Green vegetables and red meat and are my favorite breakfast foods. These should be augmented with various condiments, like horseradish, sage and any other herbs and seeds that are nearly always available in today’s world. The main point here is to include a wide variety of foods that might aid us in obtaining the all-important trace elements and micro nutrients that are vital to the function of the human body. If your time is limited in the morning, you can make a green smoothy ahead of time. (2) Use your imagination and add things that will astonish your neighbors. 1 Cleveland Clinic, Healthy Lifestyle and Heart Cookbook.